BURLESQUE FEST 2010 POSTER REVEALED! New Orleans Burlesque Festival founder Rick Delaup commissioned artist Craig Elliot to create the official New Orleans Burlesque Festival 2010 poster. This beautiful limited-edition art poster depicts a striptease dancer performing to a live jazz band. To create the original painting, Craig used oil and pencil on Rives BFK cotton paper. The size of the original work is 20” x 32”. Craig Elliott is an artist based in Los Angeles, California. He received his education at the famed Art Center College of Design in Pasadena, and studied under artists such as Harry Carmean and Burne Hogarth. Craig’s carefully crafted and arresting images of nature and the human form have captivated audiences with their visual and intellectual celebration of the beauty in this world and beyond. 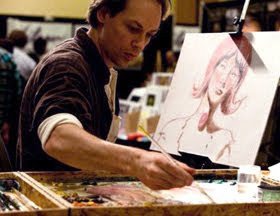 In addition to his fine art work, Craig has had a hand in designing many of today’s most popular animated films from studios such as Disney (The Princess and the Frog, Enchanted, Hercules) and DreamWorks (Bee Movie, Shark Tale). His work on The Princess and the Frog was recently exhibited in Dreams Come True: Art of the Classic Fairy Tales from the Walt Disney Studio at the New Orleans Museum of Art. "I suppose I could boil it down to trying to show visually how a woman makes me feel. Women are people who are walking art to me. Men's bodies are mere machines, women have that same functional element, but with thousands of little modifications that make them more like flowers to the eye. Flowers are meant to attract and beauty is part of what they are, but stems are just supports and leaves make food for the plant. Beauty vs. pure function - that is a big part of the key to the female form for me." "I tried to focus on the single female figure and give her all the qualities of burlesque I could think of. She's dancing with energy and almost floating in a graceful dance. She has a great personality and joie de vivre - she's someone we'd all like to know! Of course she also has beautiful curves that flow with the dance she is doing. In the end I hope she is seen as classic, lively and fun, just like burlesque itself!"